For Hawick, cup final fever has reached boiling point for the third time in the club’s long and successful history. Their BT Murrayfield meeting with city rivals Boroughmuir is just two days away and the town is clamped in the sort of enthusiasm that once characterised the Hawick club sides of the 70s, 80s and 90s. Flags, decorations and shop windows are decked out with all sorts of support for the club as the town gears up for yet another trip to the home of Scottish rugby and a chance of lifting a third National Cup title. Close to 30 coaches have been booked up for the journey north and club vice-president John Thorburn is urging more to join the procession. “We want everyone in the town behind us and help make it a day to remember,” he said. It will be Hawick’s first finals day appearance since head coach Nikki Walker helped secure 20-minutes of extra time in their 2002 BT Cellnet Cup final match against Glasgow Hawks. The powerful winger crashed over the line in the final seconds, with Neil Stenhouse converting, to draw the sides level at 17-17 before centre Gavin Douglas landed a drop-goal to earn the Greens the title. After wrapping up their first major trophy since 2006 with a comprehensive 81-10 drubbing of Peebles in the Booker Border League a fortnight ago, many thought the glory-starved Teri supporters might have been satisfied. But with a first possible Cup double – a feat the club have not achieved since 2002 – expectation has increased. “Rugby runs in the blood of this town so the expectations are always high, even higher when we are 80-minutes away from a possible title double,” said Walker. Walker has enjoyed a relatively successful maiden year as head coach of Hawick after taking over from Phil Leck in the summer. 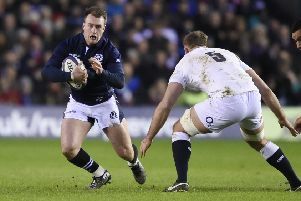 The former Scotland international watched his side endure a torrid start to the season, losing six of their opening eight games, before quickly turning things around, winning 14 out of his next 16 games to take the club to within minutes of a Premiership title play-off place. Walker also managed to end the Robbie Dyes barren run of nine years without a trophy by lifting the Border League, and admits he is proud to have been able to help contribute to the success of the club, but has called for one final push to finish the season on a high. “Where we are now, it is a massive achievement for the club. Walker added: “Boroughmuir will not be a simple task. They’ll have their professionals back, while we will be going with 22 Hawick lads, no professionals, which makes it a bit tougher. Saturday’s BT Cup final against Boroughmuir at Murrayfieldhas a kick-off time of 5.45pm.